Human chorionic gonadotropin (hCG) is produced during pregnancy by the embryo. It promotes progesterone production by corpus luteal cells. It also functions in pregnancy to promote angiogenesis in uterine vasculature, it immuno-blands the invading placental tissue so it is not rejected by the maternal uterine tissues, promotes the growth of the uterus in line with the growth of the fetus, promotes the differentiation of growing cytotrophoblast cells, promotes the quiescence of contractions in the uterine myometrium during the course of pregnancy, and also has function in growth and development of fetal organs. 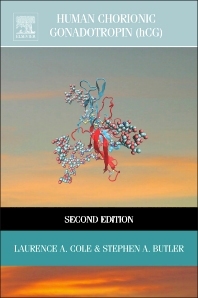 The first edition described the detailed biology, clinical chemistry, and clinical perspectives of hCG and associated molecules, and examines hCG, hyperglycosylated hCG and hCG free ß-subunit, 3 separate and independent molecules with totally sovereign physiological functions. The second edition will include coverage of the many new discoveries that have been made in the last five years: hCG analogues may be the actual driving signal of all human cancers. The editor estimates that 40% of the out of date material will be excluded and replaced with 40% of the exciting new findings. The book will also have a much clearer pregnancy and cancer focus. Dr. Cole has served on the journal editorial board from 1994-2001 as the Editor of “Trophoblast Disease Update”. He has written more than 100 articles on hCG structure, physiology and immunoassay and on clinical applications of hCG or hCG-related molecules. He has a 1.17 FWCI in the Medicine category of SciVal where he has published throughout the various disciplines and maintains an average of 12.6 citations per article from 2009-2014. He has experience with international, single, and institutional collaboration. Awards and recognition for Dr. Cole include the Institute for Anticancer Research, Biannual Prize for best research; American Association for Clinical Chemistry, Most Outstanding Research Contributor to Clinical Chemistry Prize; Gynecology Oncology, Outstanding Speaker Award; and International Society for Study of Trophoblastic Disease, Gold Medal for most outstanding research.